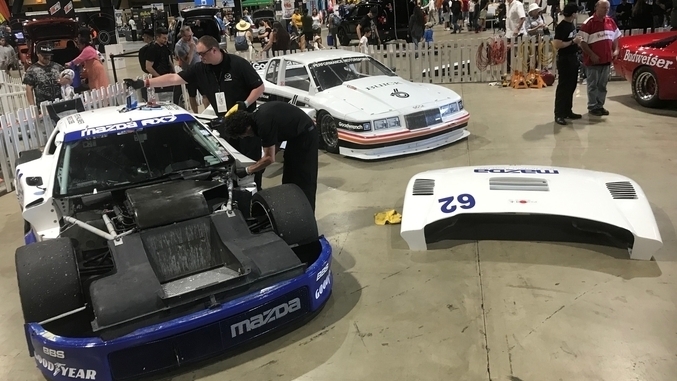 Over the weekend, the Long Beach Grand Prix celebrated the 50th anniversary of IMSA by hosting cars from its popular GTO class from the 80’s and early 90’s for this year’s vintage race. All kinds of cool cars came out: Mercury Cougars, Chevy Camaros, an Audi Quattro, and most notably: Mazda Motorsports’ #62 1991 FC RX-7. Equipped with a rare 13J, 4-rotor rotary engine, these flame-spitting monsters are a beautiful sight to see and hear just like their prototype cousin, the RX-792p. While we didn’t get a chance to catch the race on Saturday, we did get to sneak a peak at the angry rotary after practice and qualifying Friday evening. Mazda might not have won at Long Beach in GTO in 1991, but they did have a very successful season in both GTO and GTU that year. They also did quite well this year in DP during the BUBBA Burger Sports Car Grand Prix with a pair of Soul Red Crystal Mazda RT24-Ps. Check out the RX-7 navigating the bumpy streets of Long Beach last Friday during practice. Crank up the speakers for this one.